From this vantage point, you are standing in Virginia and looking into both Kentucky and Virginia. In a north-westerly direction. You are looking directly into Potter's Flats. Pine mountain begins here and runs in a south-westerly direction for approximately 125 miles. The road that you are viewing is Kentucky State Rt. 80, which runs by the Breaks Park entrance. 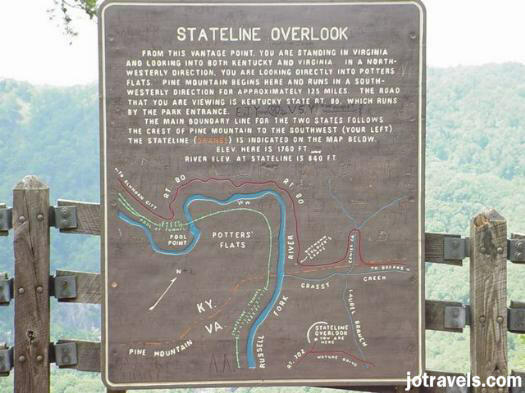 The main boundary line for the two states follows the crest of Pine Mountain to the southwest.